From time to time during my travels, I come across signs that I find interesting for one reason or another. Sometimes, they contain clever writing, are humorous, or remind me of some place or event. 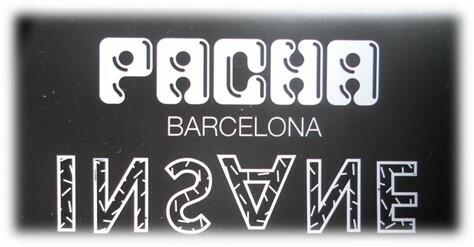 Here are some more from a trip to Barcelona, Spain. 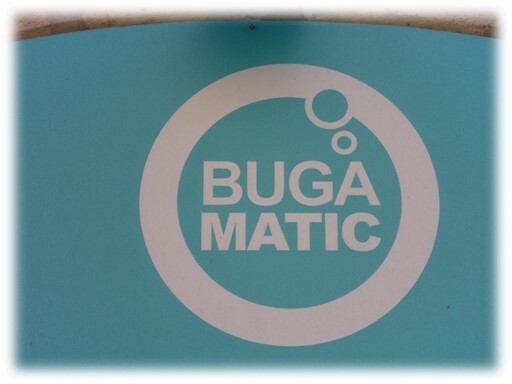 A pest-control place? No, it's actually a chain of do-it-yourself laundries. From a live-concert poster. One of the band's names was INSANE, perhaps written just the way it's shown here. Is that crazy, or what? Sign on waterfront kiosks. Beer, Coke, and ice cream all in same place; serving three of the four food groups is pretty good. 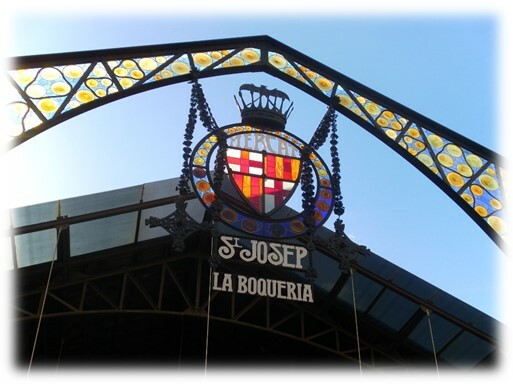 The main entrance to the Mercat de St Josep de la Boqueria, a covered market. 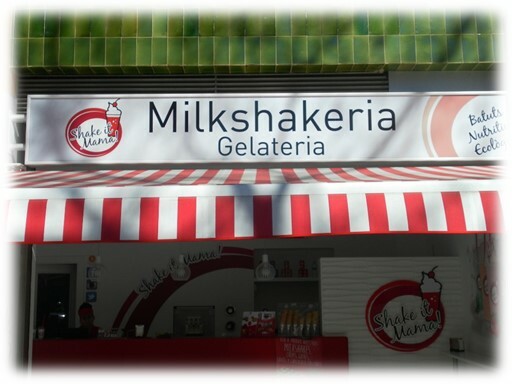 Inside, it is wall-to-walls stalls, mostly selling fish, meat, fruit, vegetables, drinks, and other forms of cheesy comestibles. 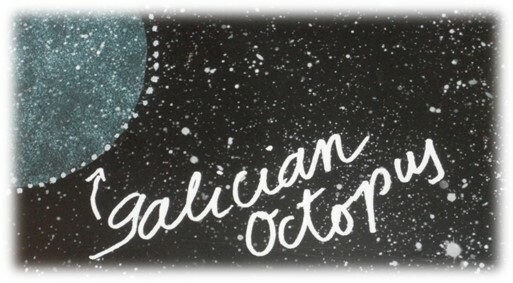 Now if you are fussy about the origins of your octopus, this stall brings them in from Galicia, an area of northwestern Spain. 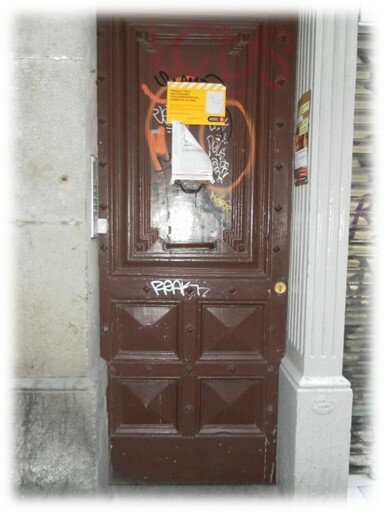 Just the kind of non-descript front door you want when you are in a Witness Protection Program, and living in the backstreets of Barcelona. Actually, this was the door to my apartment building. 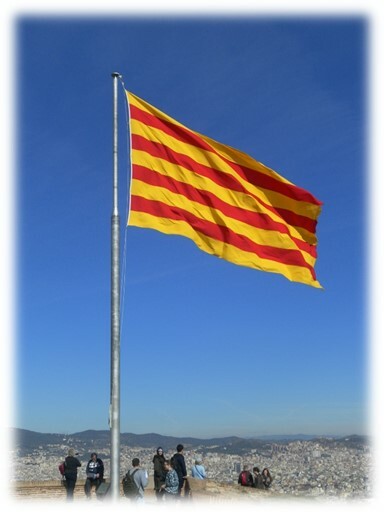 The flag of Catalonia (Catalunya, in Catalan). For some time now, there have been very strong moves towards more autonomy and even separation from Spain. A warning against bungee jumping without a cord! 'Nuff said! 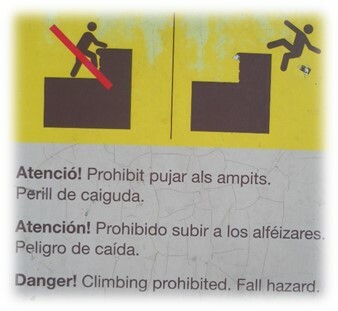 Literally, "Fall Hazard" in Catalan. What's missing is the speech bubble saying, "I'll meet you at the bottom. Love you, Honey. Oh, and I'll try to save the camera!" 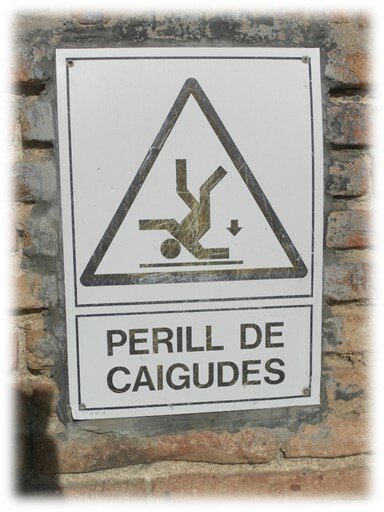 As with most public signs in Barcelona, this one is written in Catalan, Castilian (what many of us known as Spanish), and English. 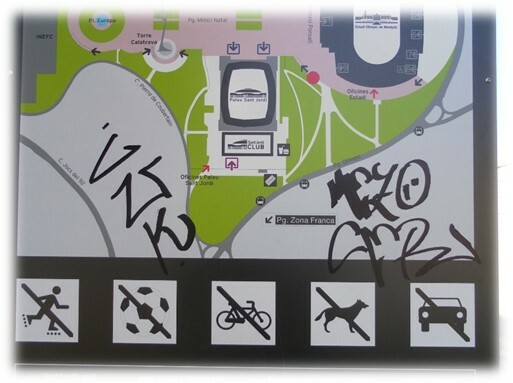 A sign outside the Barcelona Olympic Stadium. 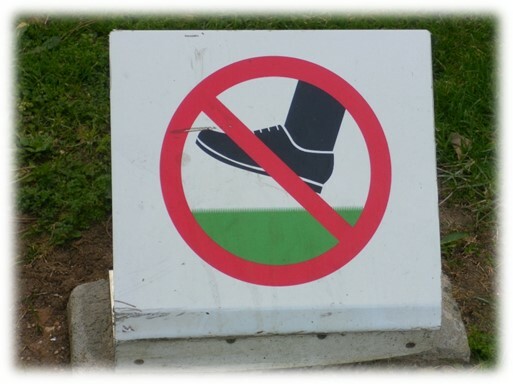 Now, let me get this straight: No roller blading, playing football, or cycling (Olymic athletes excluded, presumably), no killer dogs, and no driverless, black cars. Oh, but leave all the graffiti you want! 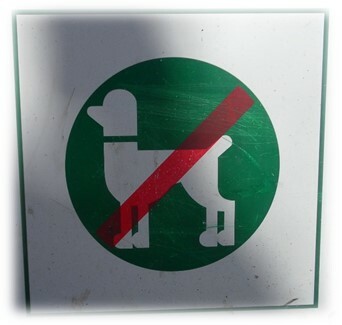 No prissy poodles here, thank you very much. I quite agree, and nowhere else either, for that matter! Just admit they simpy are glorified cats and stop embarassing the other breeds by calling them dogs. Hmm, but then perhaps the cats would be embarassed. Without even reading the text, you just know it's got to be some artys-fartsy place! The best part of the place by far was the inside and outside of the building itself, and the very comfortable, deep leather seats in the lobby. As for the art, I guess I just have my taste in my mouth! I did see one Picasso, an abstract babe with the usual deformed head. 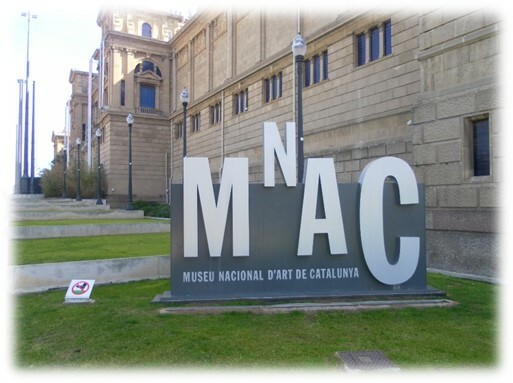 No, this is not a €10-illion painting in the modern section of the art museum; it's a sign on the grass along the outside! I'm reminded of the question, "Under which sign were you conceived?" " I think it was 'Please keep off the grass!'" Signs on an outdoor escalator leading down to Plaça d'Espanya. Here are the rules for riding, so listen up! Down the left side: No baby carriages; kids must hold Mother's hand; don't get your foot jammed against the edge; and you must carry little dogs under your left arm. Down the right side: No women in period costume or mourning dresses, and definitely no sitting on the handrail; no black children sitting on the steps; no unaccompanied children (although one would have expected a red slash instead of "NO"); and certainly no black Crocs! 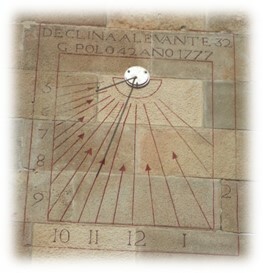 Yes, it's your basic sundial. However, this one is on the eastern side of a tower while it's mate is on the western side, so the folks defending Montjuïc Castle could tell the time during all daylight hours.